Long ago before roads opened to Spiti, people and shepherds from Kinnaur used to visit Spiti over this high pass from Bhaba Valley and enter Pin Valley. Even today this route is frequented by Shepherds in search of grazing land for their livestock during summer season. Bhaba pass is highly peculiar trek as you cross from a lush green area to a dry desert on the other side of the pass. This is a great trek for anyone who wants to see the different facets that the Himalayas offer in a span of 5 days. The trek can be done either way from Pin Valley to Kafnu in Kinnaur or vice versa. The trek starts from the little town of Kafnu amidst the Pine forests and the lush greenery in Kinnaur. The trail ascends gradually on the right bank of the Bhaba river through the woods. The intermittent open lands you find on the trail are great places for short breaks. After few switchback climbs and gradual ascents you’ll see a forest hut on a vast meadow ahead. This is Mulling our campsite for the night, which offers great views of the Bhaba valley. After breakfast continue on the trail over these vast meadows. The trail continues on the right bank of the river till the intersection of two valleys. As we continue on the trail we find a natural bridge formed by massive boulders beneath which you can hear the raging river. We cross the bridge and take right on the switchback trail to head into the Bhaba valley. After initial climb the trail flattens as we enter another vast meadows, another 2 hrs of easy walk will take us to Karah. Another easy day of trek but with a different start, brace yourself to cross the tributary of the Bhaba river early in the morning. After crossing the river you’ll find another two valleys intersecting, here we enter the left valley after climbing up a steep slope. The trail continues to ebb as we cross several streams. After a climb for about 2 hrs we reach another flat meadow with several little streams, this is Fustirang. The sunset view from Fustirang is spellbinding. Today will be a challenging and long day of the trek. The trail starts to climb immediately from the campsite through a series of switchbacks. The climb is steep and one may fell never ending. This part of the trek a lot of energy so carry enough water and keep the light refreshments accessible. After a good part of the climb you’ll see a waterfall to your left, after you climb above this region the trail relatively eases out before another burst of switchback climbs leading to the saddle of the mountains, Bhaba Pass. You’ll find prayers flags on the pass, this also signifies that you are entering a region of Buddhist yore. At the top of the pass you’ll see a contrasting view to what you have been seeing for the first three days. The mountains on the other side are browner and bereft of vegetation; in fact what you are seeing is the cold desert region of the Himalayas. After a celebratory photograph and prayers atop the pass we start our descent. After the initial descent down to the valley we cross from the left bank to right bank of the stream and continue to head downstream. The trail is unclear remember to head in the general direction looking for cairns. Once you find the trail continue till you find the cascade of the stream to the left, it descends to a lush green meadow amidst the barren surroundings. Leave the trail and descend down to the meadow, this is called Mangrungse our campsite for the night. Today is the last day of the trek, we head back up to the trail we climbed down yesterday. And continue downstream of the stream. Here you’ll also find three valleys intersecting. The valley directly opposite to the campsite takes you to the Pin Parvati Pass. We leave the three valleys behind and continue along the Pin River. Along the trail we will encounter several streams, little wooden bridges, numerous mountain goats, sheep – guarded by shepherds and their dogs. The trail offers myriad views of the valley ahead leaving you in awe of the landscape. Amidst this you’ll find another vast meadow looking like a green cricket ground out of nowhere. From here it is another 2 hr walk to the village of Mudh. The first village of Spiti Valley you’ll encounter greets you with Chortens, Prayer flags on hanging bridges and lots of smiles with Julley! Note: We also organize this trek in Reverse Direction – Starting from Mudh and Ending at Kafnu which is relatively easier provided you spend enough time acclimatizing in Spiti Valley before starting the trek. 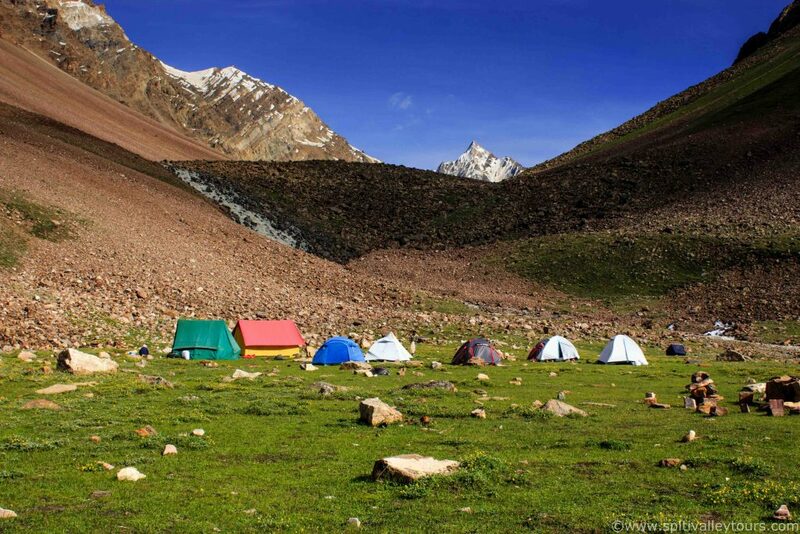 Tented accommodation and all meals during trek (4 nights).